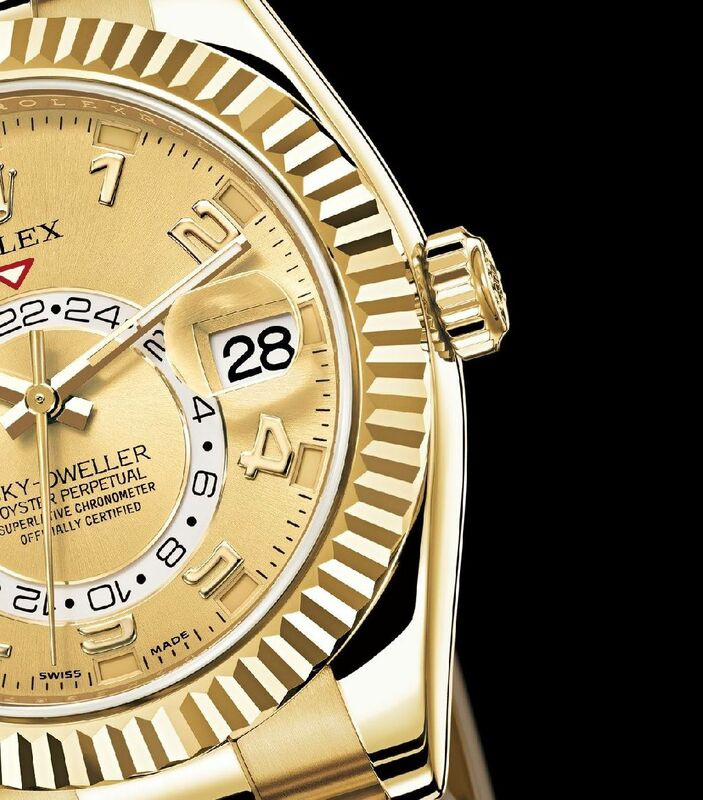 Swiss watch giant Rolex introduces Oyster Perpetual SKY-DWELLER, a new classic timepiece dedicated to global travelers. This dual time model features new functions and revolutionary design, combines many practical functions, yet intuitive to read and easy to operate. The SKY-DWELLER is also equipped with an annual calendar that automatically adjusts the date at the end of months with 30 and 31 days – thanks to a patented design that ensures outstanding reliability for this type of function – as well as a particularly practical interface for setting the watch: the patented rotatable RING COMMAND bezel. 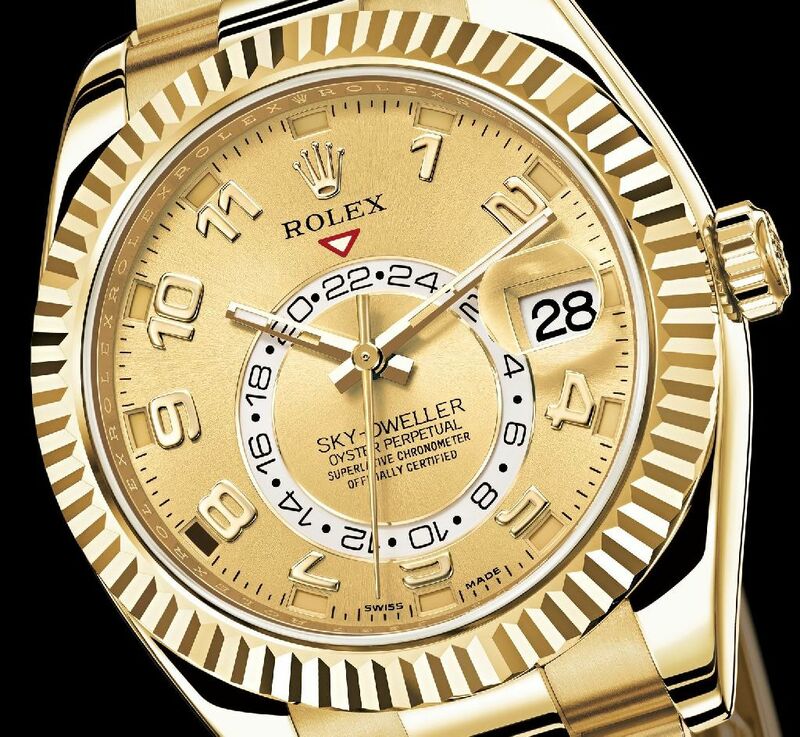 A distillation of Rolex innovation, the SKY-DWELLER incorporates no fewer than 14 patents, five of which are brand new. It is equipped with the new calibre 9001, a mechanical selfwinding movement developed and manufactured by Rolex, certified as a chronometer, with a 72-hour power reserve. 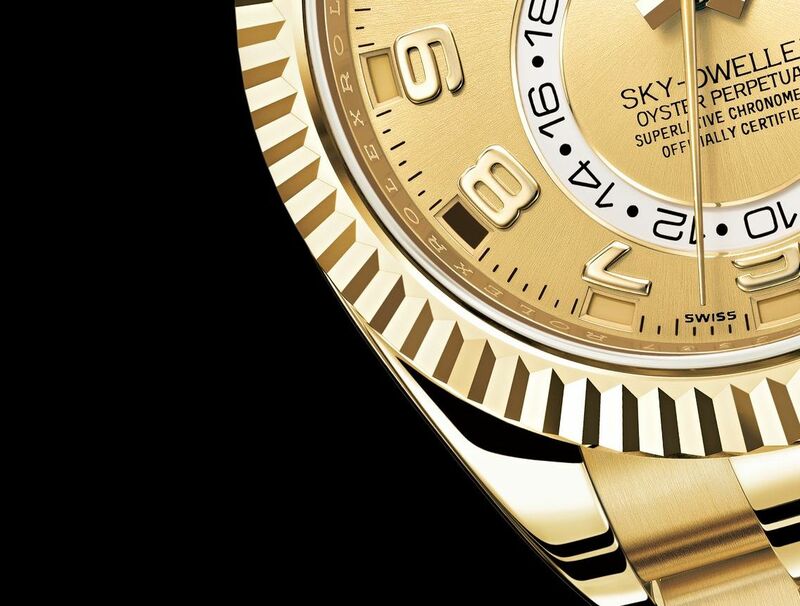 A majestic expression of the art of watchmaking and the product of Rolex’s exceptional technical expertise, the SKY-DWELLER is as intuitive to read as it is simple to use. Local time, reference time and the date are rapidly set using a highly innovative interface between the case and movement. The rotatable RING COMMAND bezel is the focal point of the interface, allowing the wearer to select the individual functions to be set simply by turning the bezel. Each function can then be adjusted swiftly and easily in both directions by means of the winding crown, which has only one setting position. 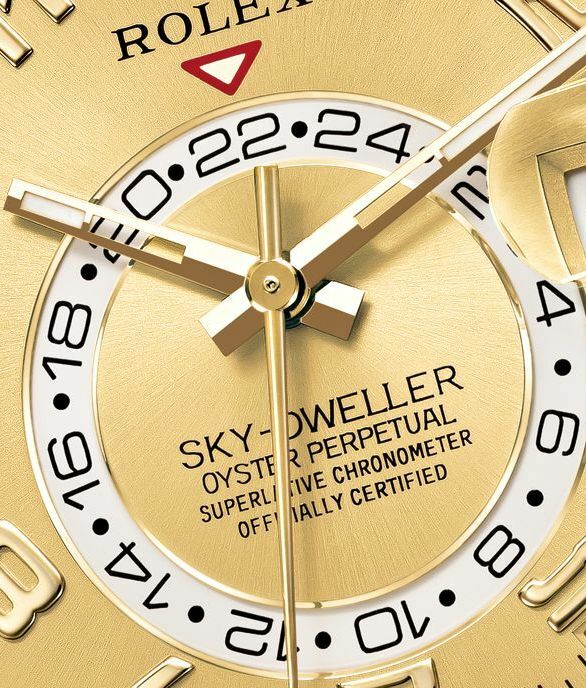 The Oyster Perpetual SKY-DWELLER features a dual time zone that is as intuitive to read as it is simple to use. The display’s highly original design endows the watch with an aesthetic identity all of its own. Reference time via an off-centre disc: Global travellers can read the reference time – the time at home or at their usual place of work – via a rotating off-centre disc visible on the dial. A fixed inverted red triangle points to the wearer’s chosen reference time. The disc’s 24-hour display allows travellers to clearly distinguish daytime hours from night-time hours in the reference time zone (for example, 10 p.m. versus 10 a.m.). At any moment and in any location, they know if it is an appropriate time to contact someone on the other side of the world. Centre hands for local time: Local time at the destination is indicated by the conventional centre hour, minute and seconds hands. It can be set very quickly and easily thanks to a mechanism that allows the hour hand to be adjusted independently in one-hour increments both forwards and backwards, so that changing the local hour does not affect the minute or seconds hands or the reference time. Date change linked to local time: The date change is linked to local time and occurs within a few milliseconds at midnight. Thus, the date displayed in the aperture is always the current date in the wearer’s local time zone. Thanks to its innovative display and simple operation, the SKY-DWELLER allows the traveller to adjust the watch to different time zones during a journey, while benefitting from a constant, clear display of reference time. A fixed inverted red triangle indicates the reference time: The 24-hour display allows the wearer to distinguish daytime from night-time hours. The combined display of local time via centre watch hands and reference time via an off-centre disc makes the SKY-DWELLER easy to read and endows it with unique aesthetics. Only one adjustment per year: This annual calendar automatically differentiates between 30-day and 31-day months. It displays the correct date throughout the year and requires only one adjustment a year – on 1st March, February having only 28 or 29 days. A system with intelligence: The ingenuity of the SAROS system developed by Rolex lies in its simple and systematic handling of the irregular occurrence of 30 and 31-day months. This intelligent mechanism is based on only two gear ratios and four gear wheels added to the traditional Rolex instantaneous date calendar. Such simplicity ensures peerless robustness and reliability for the annual calendar function. Planetary and satellite wheels: The Greek term Saros has been used since antiquity to designate an approximately 18-year cycle of alignment patterns between the Sun, the Earth and the Moon that is behind lunar and solar eclipses. This astronomical phenomenon inspired the design of the SKY-DWELLER’s annual calendar mechanism. The SAROS system is designed around a fixed planetary gear wheel (equivalent to the Sun) at the centre of the movement. A satellite wheel (whose centre represents the Earth) engages with the planetary wheel and rotates, orbiting the planetary wheel in one month, driven by the date disc. The satellite wheel is fitted with four fingers (the Moon) for the four 30-day months (April, June, September and November). Double instantaneous date change: The gear ratio between the satellite wheel and the planetary wheel is calculated in such a way that at the end of each 30-day month – and only in these months – one of the satellite’s fingers receives an additional impulse from the date change mechanism. This makes the calendar disc jump two days (from the 30th to the 1st) within a few milliseconds to display the correct date. Discreet month apertures: The months of the year are indicated in 12 discreet apertures around the circumference of the dial, outside the hour markers: January at 1 o’clock, February at 2 o’clock, and so on. The current month is identified in a contrasting colour. A particularly ingenious patented mechanism inspired by an astronomical phenomenon differentiates between 30-day and 31-day months, thanks to just four additional gear wheels. The RING COMMAND bezel can be turned to any one of three positions to choose the function to be set: date, local time or reference time. The Oyster Perpetual SKY-DWELLER is equipped with a rotatable RING COMMAND bezel that allows the wearer to easily select the watch’s different functions via an innovative, patented interface between the movement and case. Unrestricted setting: The RING COMMAND bezel can be turned to any one of three positions to select the function to be set: date, local time or reference time. The selected function can then be rapidly adjusted in either direction, forwards or backwards, using the winding crown, which has only one setting position. Unlike traditional mechanisms, this interface developed by Rolex allows unrestricted setting. A simple and intuitive interface: This simple and intuitive interface is based on a complex mechanical module which consists of no fewer than 60 components and demands state-of-the-art watchmaking and micromechanical expertise. The heart of the mechanism is a double cam and levers that engage various gear trains inside the movement according to the function selected. 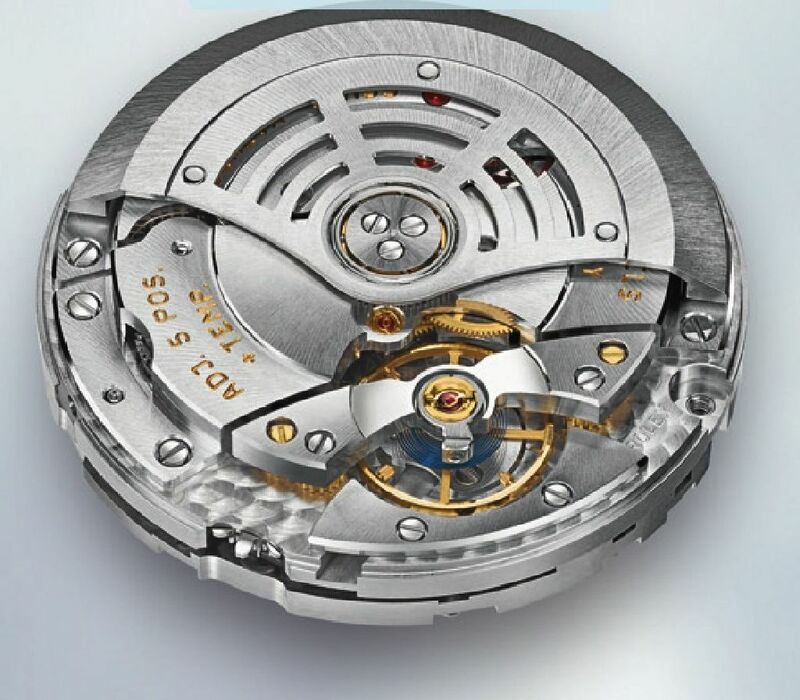 One of these cams is activated by pulling out the winding crown; the other is driven by rotating the bezel to activate setting wheels located in the middle case of the watch. An expression of Rolex values: With its innovative interface between the watch case and the movement, the RING COMMAND bezel is the product of Rolex’s total mastery of the design and manufacture of all the essential components of the watch. 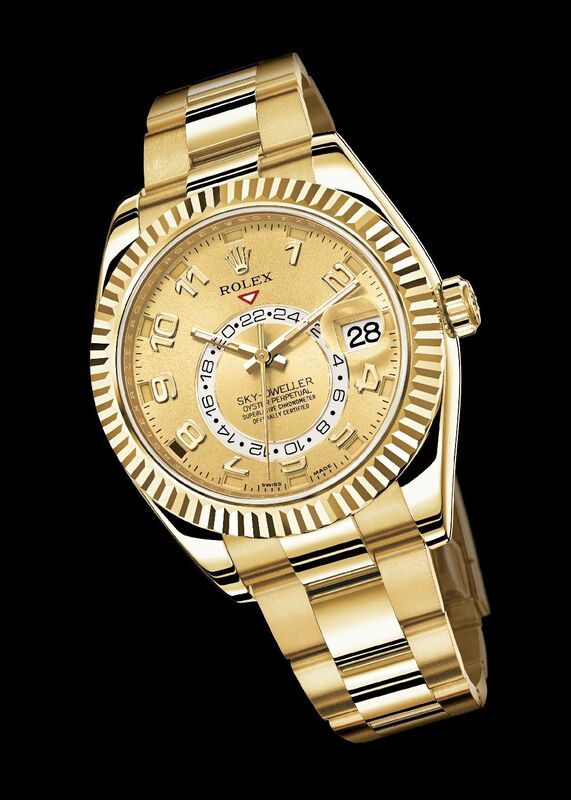 Rolex once again demonstrates core values that have always placed an emphasis on functionality and wearer comfort. Classic elegance of the fluted bezel: With its iconic Rolex fluting, the SKY-DWELLER is firmly established in the lineage of the models in the OYSTER collection, such as the Datejust or the Day -Date , which have become symbols of prestige and timeless elegance. The Oyster Perpetual SKY-DWELLER’s caliber 9001 is a completely new self-winding mechanical movement, a pure distillation of Rolex technology. Entirely developed and manufactured in-house, with a total of 380 components and backed by seven patents – four of which are new – it is one of the most complex calibers ever developed by the brand. A selector wheel on the outside edge of the movement ensures the interaction of the movement and the bezel of the watch to set the functions. Chronometric precision: Calibre 9001 is a certified Swiss chronometer, a designation reserved for high-precision watches that have successfully passed the Swiss Official Chronometer Testing Institute (COSC) tests. The oscillator has a blue PARACHROM hairspring patented and manufactured by Rolex in an exclusive paramagnetic alloy. Singular reliability: The architecture behind the 9001, like that of all PERPETUAL movements at Rolex, makes it singularly reliable. The oscillator is fitted between high-performance PARAFLEX shock absorbers, developed and patented by Rolex, that offer 50 per cent greater resistance to shocks. It is held firmly in place by a height-adjustable traversing bridge. The SAROS annual calendar and the RING COMMAND setting system are also designed to be exceptionally robust.